The Production by Referral Source Report displays production amounts during the previous 12 months as a result of referrals from professional, marketing, and other non-patient sources. 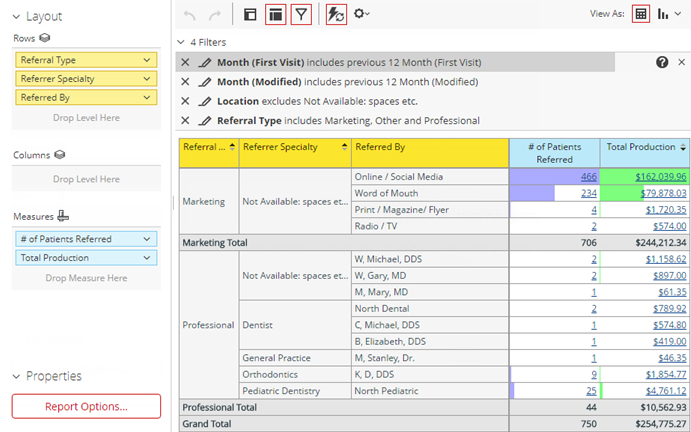 For each referral source on the report, the number of referred patients and total production appear. The report also displays the total production from all referral sources combined. On the Power Reporting page, click (or tap) the Production by Referral Source icon. has this been pushed out to production systems? I cant find this report in my power reporting. Also, is there now a field we can use in our own reports that show these professional/non-patient referrals? Currently, this report is on beta systems and is scheduled to go to production systems on 5/16/2017. At that time, there will also be new Referred By fields available for you to use on your own reports (ledger- and patient-related reports). With the issues that occurred last week clearly delaying this update, are we going to see this update roll out soon? We really want this report functionality.